(From Pentax lens literature) The new smc Pentax DA 18-270mm F3.5-6.3 ED SDM high magnification interchangeable zoom lens offers a 15X zoom ratio to cover focal lengths from wide angle to super telephoto, while its built-in supersonic AF driving mechanism achieves both smooth, quiet autofocusing operation in a compact, lightweight design. The lens offers an extraordinary wide angle-to-long-telephoto zoom coverage making it extremely versatile and handy, allowing the user to effortlessly capture a wide variety of subjects, ranging from landscapes and snapshots to sports events, without the need to change lenses. When mounted on a Pentax K-mount interchangeable-lens digital camera body, this zoom lens offers a 15X zoom ratio, the longest range in the Pentax lineup, covering focal lengths from 27.5mm wide angle to 414mm super telephoto (equivalent 35mm range). Ideal for travel photography, this focal range enables photographers to capture a wide variety of scenes and subjects without needing to change lenses. Its newly designed optics serve as the key to achieving such wide zoom coverage in a compact, lightweight body, for optimal versatility and maneuverability. Thanks to the incorporation of the Pentax-original SDM autofocus system driven by a built-in supersonic motor, this zoom lens offers exceptionally smooth and quiet autofocus operation. When mounted on an SDM-compatible Pentax K-mount digital camera body,* the focus mode is automatically switched to SDM-assisted autofocusing to ensure dependable, flawless AF operation. * This lens is compatible with the Pentax K-5 II, K-5 IIs, K-30, K-01, K-5, K-r, K-7, K-x, K-m, K20D, K200D, K100D Super and K10D camera bodies (with Ver. 1.30 or later firmware installed). When mounted on other camera bodies, the focus mode is automatically switched to manual. Incorporating two extra-low dispersion (ED) elements in its optics, this zoom lens delivers bright, high resolution images, even on the edges, while effectively minimizing chromatic aberration. The new smc Pentax DA 18-270mm F3.5-5.6 ED SDM zoom lens will be available at retail outlets nationwide and online in November 2012 with a suggested retail price of $799.95. 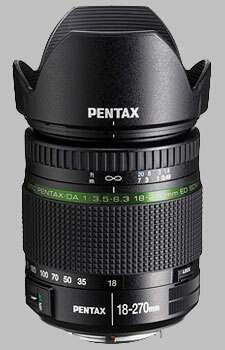 The Pentax 18-270mm f/3.5-6.3 ED SDM SMC DA doesn't have any user reviews yet!